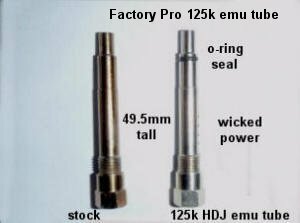 Factory Pro Replica jets, Keihin and Mikuni, follow the original manufacturer's size scale so the Factory Pro Replica jets are interchangeable with original jets - saving a lot of time and improving accuracy for a good tuner. Known as: "Keihin small, round, slotted jets"
Known as: "Keihin long hex jets"
415 491 5920 FCR only I got really tired of trying to use the original Keihin numbering / profile codes, so I made my own. Very nice if you have everything perfect at every throttle position except for 1/4 and only want to change that 1 thing! Flatslides are super easy to tune on the EC997 dynos and not easy on anything else for many different reasons. Factory Pro's HDJ emulsion tubes for mx type, original equipment FCR carbs. Not for aftermarket FCR carbs. Replaces original FCR emulsion tube. Makes more power and improves throttle response. On a test yz250f, we gained 5% to 7% hp at peak. fits Yam, Hon, Suz, Kaw, KTM and others with 49.5mm stock tubes. for orig equipment mx type Keihin FCR carbs. Not for aftermarket FCR carbs. note the fuel droplets at the backside of the needle. note the white spray at the backside of the needle. Easily retrofitable in many OEM Keihin, Mikuni and aftermarket carbs and simple to make minor modifications in manufacturing process to incorporate. Significantly better fuel atomization, runs without misfire at leaner fuel delivery rates, better power from the same amount of fuel, more consistent, smooth running, as verified on EC997 Low Inertia dyne FLUX value engine smoothness testing. I can explain that if you are not using that dyne system and cannot get that data. All what an MJN promised, but it can run cleanly at all rpms and, because it still used a tapered needle, is easy to tune properly. 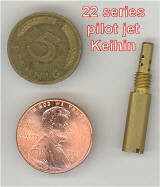 5 x .8 thread Commonly called "Keihin Hex jets" Used in most Keihin FCR's, Smoothbores and some dirt bikes. Experienced tuners know that proper design and multi-step inspection processes are necessary to produce the highest quality carburetor jets. Each metering orifice is identical - jet to jet! 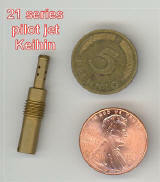 Factory Keihin Main Jets are designed to be direct replacements for Genuine Keihin jets. Original "0,2,5,8,10" numbering system for "Keihin style". Factory Mikuni Main Jets are designed to be direct replacements for Genuine Mikuni jets. Original "0,2.5,5, 7.5, 10" numbering system for "Mikuni style"
Designed to flow on the OEM fuel flow scale - not an arbitrary scale that locks tuners to hard to find brand. Northern California's most unforgettable flying experience.